A refreshing, ice-y treat before summer ends? I shared this last August, and just had to again. Rummy-yummy and super easy, my adult popsicles are great for parties, picnics, barbecues, beach bashes – you name it. Tropical fruits are perfect partners with rum and Angostura orange bitters. And of course, fruit adds a healthy punch. The Zipzicle ice pop sleeves make these an especially fun and portable treat. A cooler with plenty of ice is all you need to take them on a picnic or to the backyard. The pops may be made well in advance – ready to go when you are. I made so many of these last summer when I was testing, that I still have some in my freezer! And they’re still very slurpable :o) Leave out the rum if you want a frozen fruit treat for youngsters. 1/2 cup Angostura® 7-Year Caribbean Rum 4 oz. 3 cups diced* ripe mango about 16 oz. 3 cups diced fresh pineapple about 16 oz. Measure rum in a liquid measuring cup; stir in orange bitters and set aside. Place diced mango in blender container. Add half the rum mixture; cover and blend until smooth. 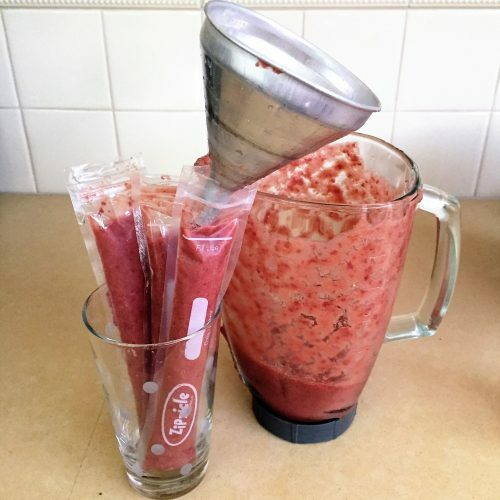 If needed, stop blender and stir fruit a bit. When fruit is smooth, pour into a 4-cup liquid measuring cup or a pitcher with a spout. Repeat with pineapple and remaining rum-bitters mix. Add to pureed mango, stirring well. Open ice pop sleeves. With the funnel, fill one at a time, stopping at the fill line. Seal and place upright in a tall container. * When all are filled, freeze for 2-3 hours or until frozen. To serve, place frozen pops with ice in an ice bucket or cooler. * Frozen pops open easily if you wrap your hand around the pop for a minute. Then open the top and push up from the bottom. 1/2 cup Bourbon1/4 cup Sweet Vermouth1/4 teaspoon Angostura Aromatic Bitters3 cups canned cherries in light syrup, drained (about 16 oz. )3 cups diced fresh pineapple (about 16 oz. 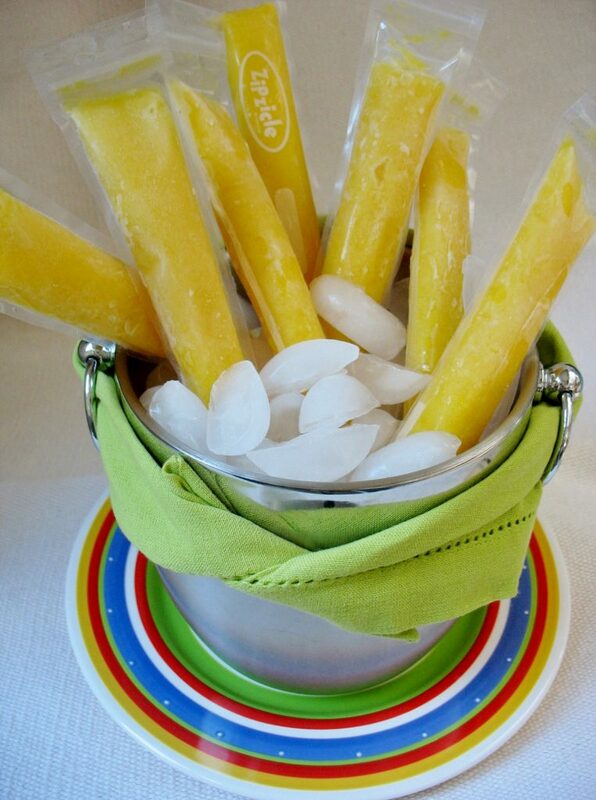 )Follow directions for preparing Mango Tango Pops. * Kitchen Notes: Sweetness depends on the ripeness of the fruit; really ripe fruit makes a sweeter pop. The puree does not have to be perfectly smooth; small chunks are okay if they’ll fit through the funnel. Puree may be made a day ahead and refrigerated. It’s ok to lay pops down to freeze; the shape will be a bit flat rather than round. When serving, ice is not needed to surround the frozen pops if served within 5 minutes or so. Zipzicle sleeves can be purchased on Amazon. And at Bed Bath & Beyond, Target, and Cost Plus/World Market; call first to confirm. These look SO refreshing! And I have bitters, so, I’m all set to try them! While I don’t have the sleeves, I did order popsicle molds last week, because I’m all excited to try making my own paletas. The sky’s the limit, in terms of flavor, which your delicious looking recipe clearly demonstrates! Pinned this on Pinterest! ooh, glad you like the pops and how perfect that you just ordered molds! If you like a Manhattan, take a look later today when I add Tropical Manhattan pops to this post. Substitute cherries for mango, and replace rum with 1/2 cup Bourbon, 1/4 cup sweet Vermouth and 1/4 tsp Aromatic Bitters. I thought it was yum! Yes, these will work in pop molds! I should have mentioned that. Oh my god! It’s going to be, like, a zillion degrees in Napa this weekend! 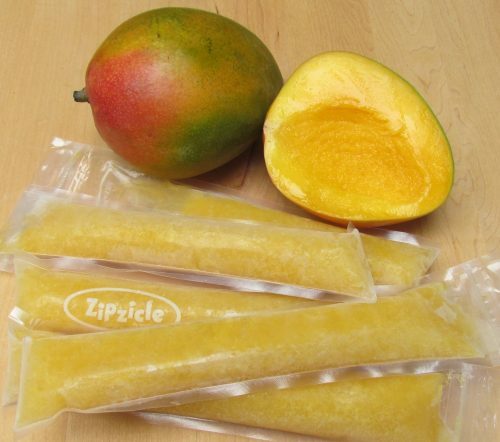 I wish I had some of those Zipzicles because I’d totally make this recipe and because, well, everything’s better with booze! I’m going to see how long they’d take to get here…. I’ve also wanted to try sweet nectarines along with pineapple. My son REALLY loves Mangos. We will try this.